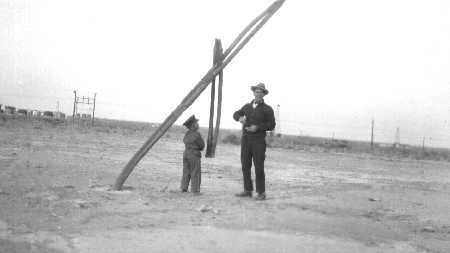 1929 Texon Texas oil field scene. This is a set of jars that blew out of a well when the crew struck "gas and oil" while drilling with a cable tool rig. The high pressure blew all the tools and the cable along with mud, gas, and oil out of the hole. You can imagine the condition of the drilling rig after all this transpired. This set of jars stuck as you see it into the ground not far from the drilling rig. It was such a tourist attraction, the contractor left it for the public to view and enjoy.